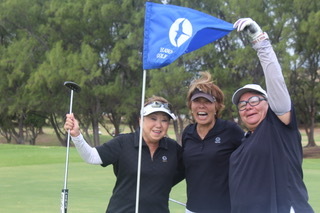 Val Vares (right) celebrating her Hole in One on #10 with playing partners Janet Shadron and Susan Church @ the 2016 HSWGA Fall Fest Tournament held at Hawaii Kai Golf Course. Player must belong to the HSWGA club. The Hole in One can be on any golf course. Hole in One must be verified by a witness and reported to the Pro Shop. Information needed: name, address, phone number, date of HIO, course name (can be out of town), hole number, yardage, and club used for the HIO. Made HIO on Sunday at Jennie K but didn't win the car (wrong hole)!!!! Biac Frame and Paula Trask getting their Hole In One ball Marker at the HSWGA Spring Fling @ Kaneohe Klipper on February 27, 2017.